This is my first Mr. Pinkerton book and I was taken, more than anything else, by the title which is the kind of simplistic thing I love. I read a bit on the series and decided to jump right in though I'm not familiar with the author. 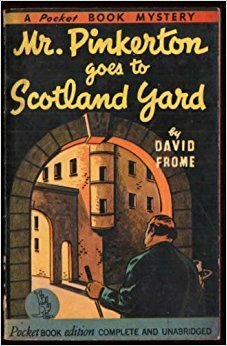 David Frome is the pseudonym for a prolific writer named Leslie Ford who was really Zenith Brown (1898 - 1983) whose work I have heard of but am not familiar with - Leslie Ford, that is. At any rate, I got my hands on an old paperback and lo and behold, I've discovered another enjoyable series to wade through when availability and budget permit. 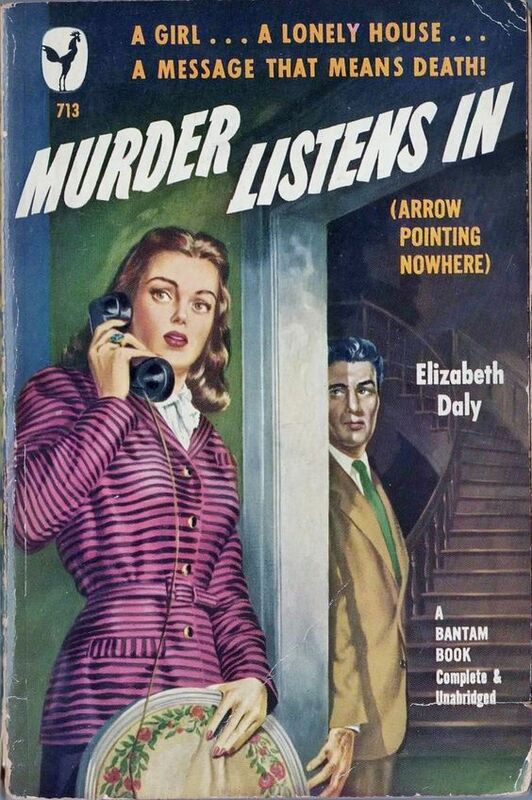 And based on the writing talent displayed in this particular whodunit, I will eagerly be looking to read the rest of Zenith Brown's output under the names of both David Frome and Leslie Ford. In this series, Mr. Pinkerton is a rabbity middle-aged widower whose wife, when she was alive, made life a living hell. Money-wise he is comfortable, thanks to his late wife's parsimony. Upon her death (minus any will), Mr. Pinkerton inherited the boarding house they lived in and quite a bit more money than anyone thought Mrs. Pinkerton possessed. But despite his wife's death, Mr. Pinkerton has not been set free from a life-time of conditioning. He is still inclined to filter his day to day through the prism of his late wife's disapprobation. Old habits are hard to break. Since so far I've only read this one book in the series, I can't compare it with any others. Here, Inspector Bull does most of the actual detecting and Mr. Pinkerton is pretty much on the sidelines adding his two cents now and then. We are privy to some of his thoughts but it's Bull who's front and center. I'm wondering if this will be true of the other Pinkerton books - at some point I'll find out. Not that I mind it, for surely it makes more sense to have the Scotland Yard man do most of the grunt work. Though sometimes it's Pinkerton who steers him in the right direction. On the other hand it is a bit odd that Pinkerton is allowed the freedom to accompany Inspector Bull hither and yon as he tracks down nasty killers who often-times wind up trying to kill Mr. Pinkerton as well. In MR. PINKERTON GOES TO SCOTLAND YARD, we come up against a murderer whose weapon of choice is poison, but as usual suspension of disbelief is needed as Bull allows Pinkerton the unusual freedom of hanging around a murder investigation though he has no legal standing. A month or so after being prompted by a newspaper article to make a bet with Inspector Bull over the probability that there are murders which go undetected by the police as murders, Mr. Pinkerton overhears some unpleasant gossip. An old woman by the name of Mrs. Ripley is likely being poisoned by members of her household. Curiosity gets the better of Mr. Pinkerton and he is moved to discuss what he's heard with the actual doctor on the case. The doctor of course poo-poos this odd little man who pops up out of nowhere to accost him in the street. In truth, Mrs. Ripley is actually better than she's been in days. But then things abruptly take a turn for the worst. The wealthy Mrs. Ripley despised her family and they, in turn, despised her. So when she is poisoned there are several ready suspects at hand. Was the killer Evelyn Ripley, the daughter who was at her mother's constant beck and call? Was it her sister Mrs. Cornish, a widow who had previously been banished when she married a man her mother couldn't abide? Was it the younger brother Hugh Ripley who is also inappropriately in love and lacks the funds to do anything about it? Was it Portus Ladysmith, curate of St. Barnabas in the Field, who was in desperate need of funds for his poverty stricken dock-side church? All benefit in some way from the old lady's will. A second murder upends the police's investigation which had centered on one person being the most likely culprit. Later we get the usual verbalized denouement in a roomful of suspects as all is revealed by Inspector Bull. But not before the long overdo discovery of a third murder heretofore undetected. It takes Bull and Pinkerton most of the book to finally realize that the killer is 'hiding' in plain sight. The motivation for all this killing is weak but workable. I enjoy whodunits and this is a pretty good one even if the reasoning in the end is a bit faulty. I'd read a Henry Gamadge book quite a while back but it was not nearly as intriguing or as engaging a mystery as this one. 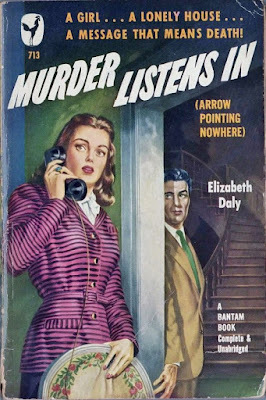 ARROW POINTING NOWHERE (aka MURDER LISTENS IN) despite one of its titles, has nothing to do with archery and all to do with a cunning mystery, murder and family obfuscation - what could be better? Henry Gamadge is an author/dealer/sleuth currently doing secret work for the War Department and so you'd think he's be fascinating in and of himself, but unfortunately as created by Elizabeth Daly, he has little personality and almost nothing memorable about him (though there are some who find him charming). But this particular book still makes for an excellent mystery and fascinating puzzle highlighting human behavior at its most bizarre. I read it in large gulps of anticipation. My favorite way to read a mystery. It occurs to me to interrupt myself at this moment and mention that memorable sleuth protagonists are quite difficult to create without giving way to satire or copycat embellishment. 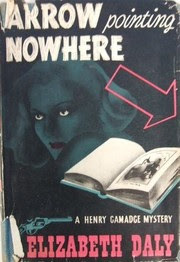 Lately I've read several mysteries where that the main guy or gal remained a kind of cardboard dud for the entire book. It's quite obvious that Agatha Christie and Ngaio Marsh and John Dickson Carr and even Ellery Queen and all the other Golden Agers who were capable of fashioning vivid detectives, amateur or otherwise, must have had a quite separate ability for creating interesting sleuths who immediately spring to life. 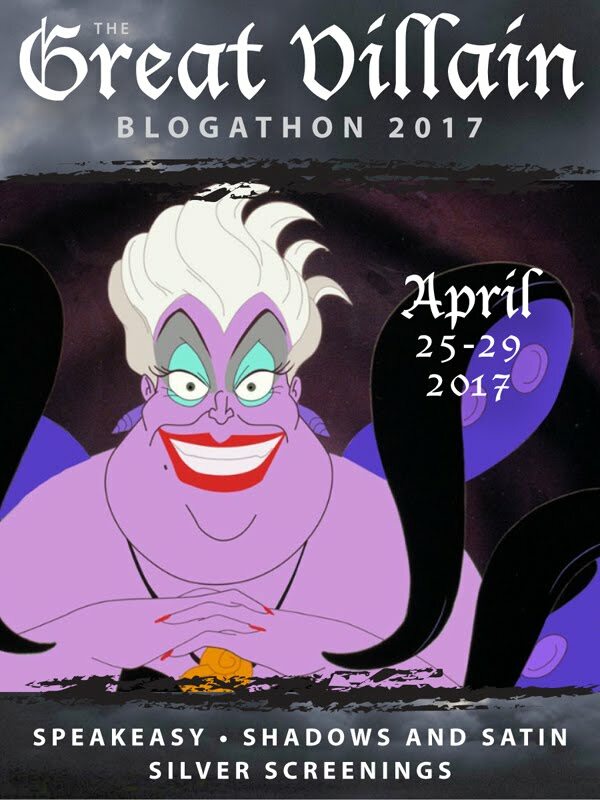 It's funny how some authors can bring most of their characters to life, but leave their main protagonist completely draped in blandness. When Henry Gamadge gets a secret (and very nebulous) message handed him by a rather intelligent and observant mail man, he must find a way to get invited to the house of people he doesn't know. Time seems to be of the essence. So thinking quickly and with the aid of a book dealing connection, he is able to affect an entrance to the Manhattan mansion of Blake Fenway, head of a reclusive family of wealthy New Yorkers. 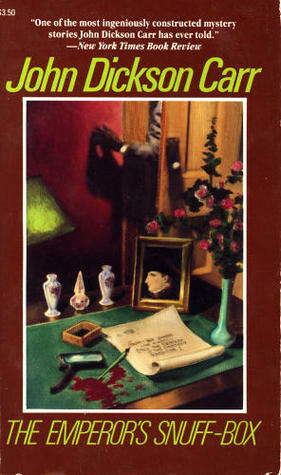 Having cleverly gained entrance to the Fenway mansion, home of a family that reviles publicity and shuns the limelight, Gamadge meets several of the Fenways (after first scoping out the land while lurking in the shadows the night before) and soon he believes he knows who sent the message and why that person could not have contacted him in the normal way. Head of the family Blake Fenway, a book collector and a very likable chap. Unmarried, the Fenway name will come to an end with him. Caroline Fenway, unsettled but pragmatic daughter of the house. Belle Fenway a widow and Blake's sister-in-law - an invalid in a wheelchair since an injury aboard ship while fleeing from the war in Europe. Belle's son, Alden, a grown man with the mind of a five year old boy. Craddock, Alden's 'keeper' whose job it is to watch out for the unfortunate man/boy and keep him out of trouble. Miss Grove, Belle Fenway's grim-faced companion. Mott Fenway, a penniless older cousin beloved by most. And of course, the servants. Not living at the mansion at the moment but very involved in the story-line is Hilda Grove, Miss Grove's niece, a wide-eyed innocent who has been sent up to Fenbrook, the Fenway country house to do some research among family records. Craddock, who is himself penniless, has a tenderness for young Hilda thought Blake Fenway is uneasy about it. How all these disparate characters figure in the ever-expanding investigation is a mystery which little by little, Gamadge manages to piece together despite two giant red herrings placed in our path almost from the getgo. Much of Gamade's deductive reasoning is arrived at without much explanation, so you have might have to stop for a moment now and then and say, "Wait - what?" I did. After Gamadge's first introduction to the family, he is taken aside by cousin Mott who attempts to explain the root of the obvious family tensions. He sets up a second meeing but the very next day someone pushes poor Mott out an upper window. And through some rather fanciful putting together of two and two making four, Gamadge realizes that Hilda Grove may be in danger. But when the second murder occurs, it is not Hilda who is found dead. From strange beginning to even stranger end, this is a fine mystery worth looking for. I found it by accident when someone recommended Elizabeth Daly and I was reminded that I'd meant to read another. Even though I hadn't much liked the first one I'd read - I occasionally like to give these things a second or even a third chance. I do enjoy mysteries set among upper crust families, dead bodies turning up in a large mansions - the incongruity of it all. Additionally I will say that this story despite some familiar devices, features an unique twist which I don't remember having ever encountered before. I'd say even if you've been disappointed by a previous Elizabeth Daly book, forget about it and pick up this one. This is an excellent whodunit by a writer I'd never heard of much less read until now. (If I'm not mistaken, McCloy was recently recommended by a blogging friend whose name (as usual) escapes me at the moment. My paperback copy has an introduction by Anthony Boucher, the brilliant and influential mystery maven author and editor for whom the annual Bouchercon convention of mystery buffs and writers is named. He prized McCloy's talents and champions the fair-minded set of clues the author lays before the reader. As some of you know, I am less interested in fair-minded clues laid before me than I am in being stumped and intrigued by a clever plot and wonderful writing. And oh yes, I must like (and/or find interesting) the main detective, amateur or otherwise. In this particular case, I wasn't bowled over by Basil Willing, psychologist/sleuth and police help-mate, but I love his name so much that I am willing to overlook the fact that he isn't a very vivid presence in this particular book (the only McCloy book I've read so far). He's okay in the role, but I'll have to read more before I make a final decision. New York, April 28 - Police are puzzled by the odd behavior of a burglar who broke into Marcus Lazarus' knife-grinding shop near West 44th Street shortly before dawn yesterday. Nothing was stolen but the intruder opened the cage of Lazarus' pet canary and set the bird free. The shop is hardly more than a shack in an alley leading to the stage door of the Royalty Theater." A new production of an old chestnut ('Fedora' by Victorien Sardou) starring vivid with a vengeance actress Wanda Morley gets more publicity than the leading lady (or anyone else) bargained for when one of the actors is murdered on stage at the Royalty theater on opening night. Don't you love when that happens? Only one of the few characters in a particular scene could have bumped off the actor who (coincidentally) had the part of someone pretending to be dead. Oh. the irony. Basil Willing, psychologist and medical assistant to the District Attorney's office, shows up on the case, brought in by the entreaties of the young costume designer and her friend (and ex-fiance) the male lead in the show who was apparently panting after the leading lady, a known home-wrecker. Turns out the dead guy was Wanda Morley's latest married fling and Pauline the costume designer believes the police are ready to arrest Rodney Tait, said lead in the show. Motive: jealousy. But Rod says he was most definitely NOT in love with Wanda and that it was she who was chasing him and making his life miserable. Oh by the way, Basil Willing had been at that opening night and so was already familiar with the case and with the suspicious circumstance of the black caped person climbing up the theater's dark and shadowy fire escape. There are tons of clues in this fair play mystery and if the reader is as finely attuned to the quirks of human psychology as is Basil Willing, then the murderer will be evident to the reader shortly after a certain fact becomes known about midway through the book. The two main clues are the freed canary and the odd behavior of a house fly. Though head scratchingly esoteric, it is all explained in the end, remembering that psychologists don't think like the rest of us. There are, of course, red herrings and the clue of the underlined paragraph in a script which I suppose makes some sort of sense - yet on the whole, it all works together. THOUGH, I must say that the motivation is as old as time but for all the distracting murder mystery finessing and the remarkable luck of the killer who gets away (at least for awhile) with murder twice over on the same character if not the same actor. 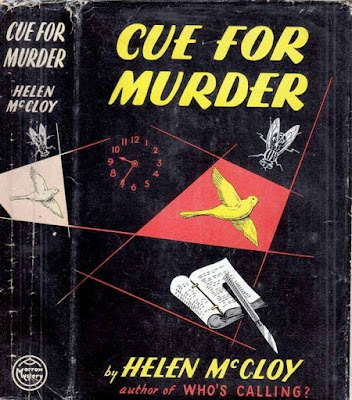 Nothing is memorable here except for the canary clue and maybe the fun of the backstage comings and goings, but still I thought this was quite a good example of a tricky whodunit from a lesser known Golden Age author. I will be reading more of her work. 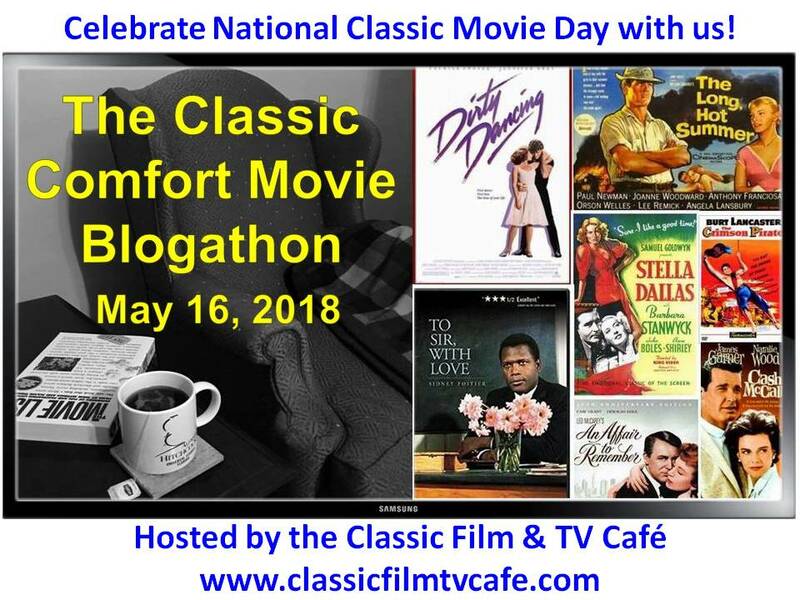 Since it's Friday, don't forget to check in at Todd Mason's blog, Sweet Freedom - Todd is doing hosting duties this week for author Patricia Abbott - to see what other forgotten or overlooked books other bloggers are talking about today. My apologies, I can't remember which of my blogging friends recommended this book - so sad when you're old and decrepit and your memory fails to function. But whoever it was, THANK YOU!! This is another terrific Carr book. (I recently began re-reading Carr having totally forgotten the books from the first time around.) THE EMPEROR'S SNUFF BOX is so well set up and so smartly written even if the heroine is a bit of a drip whose behavior on an important night defies logic. But so what, we go along because Carr wants us to and because he's a man and what do men know about women anyway. Right? Besides, in those days of long ago, women were expected to be a bit malleable. You know, there's something about Carr's writing that almost, ALMOST smacks of soap opera, but he does always manage to steer clear and deliver the goods. 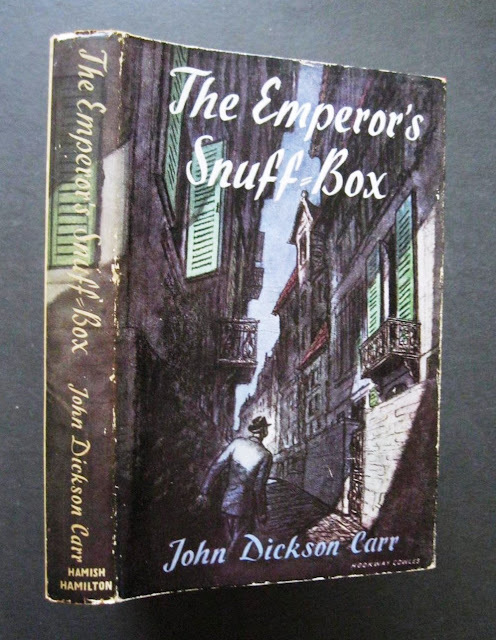 THE EMPEROR'S SNUFF BOX is not part of Carr's regular series stuff and does not feature Dr. Gideon Fell or Sir Henry Merrivale. The detecting genius this time out is calm, cool and collected Dr. Dermot Kinross, a psychologist and expert in the criminal mind. The heroine is Eve Neil, she who behaves in very silly fashion, abandoning her common sense when it's needed most. But that is who she is. She also happens to be exceptionally beautiful and rich and will become the main suspect in the murder of her fiancee's father. The settings are intimate enough, two French villas across from each other - this is the sort of book that would make for a good play since there are few locations and events take place in a short period of time. At any rate, Ned Atwood is Eve's ex-husband, a man whom she should never have married. He is a handsome and charismatic n'er do well who treated Eve badly yet claims to still love her. We learn early on that he was capable of more than just verbal abuse during the marriage - a thoroughly bad lot as they used to say, but the sort to which certain women gravitate. Hey, he has curly blond hair. Meanwhile, the Lawes family lives in a corresponding villa across the street from Eve and she has recently become engaged to Toby Lawes, the upright, uptight son of the family. He appears to be everything that Ned is not - he works for a stodgy bank who will brook no scandal in their employees' lives and he worships Eve. When Ned reads about the engagement, he uses his old key and shows up one fateful night in Eve's bedroom determined to convince her not to marry the stiff shirt across the way. What Ned fails to recognize is that after being married to him, Eve is desperate for a 'normal' seeming man who will treat her well and give her a the quiet sort of life she yearns for. What Eve fails to recognize is that Toby Lawes might have a secret or two of his own. Anyway, while trying to convince the persistent Ned to leave her bedroom before scandal ensues - they eventually discover that all is not as it should be across the street. Looking directly into the third floor study, they can see that Maurice Lawes, Toby's elderly father, is slumped at his desk with his head smashed in. What follows is one of those stories where things just get worse and worse. Of course, everybody's lying and things better left unsaid get said and secrets are exposed and everything that happens looks suspicious and for sure the police zero in on Eve because of what happens shortly after she forcefully ushers Ned out of her house and into the darkened garden. Oh, and there's a sinister maid named Yvette which I found very funny. Lately I seem to be running into characters named Yvette all over the place. This Yvette is not above lying and making things very difficult for her employer. I admit that I figured out who the killer probably was early on, but that's only because I've read a million mysteries (or just about) in my life and I've learned to recognize certain tip-offs - this is a fair play sort of thing so the clues are there. I figured out the 'trick' and felt pretty good about it. But even then, I wasn't sure until nearly the end. I also didn't like that the motive is kind of forced and out of left field, but that's a minor quibble since everything else works beautifully. If you are new to mysteries (or just new to Carr) this would be a terrific book to begin with because it contains the dazzling sleight of hand Golden Agers Carr and Agatha Christie were famous for and it provides as good a surprise ending as those uninitiated among you could wish for. Lots of fun to read. So far I'm doing very well with Carr. 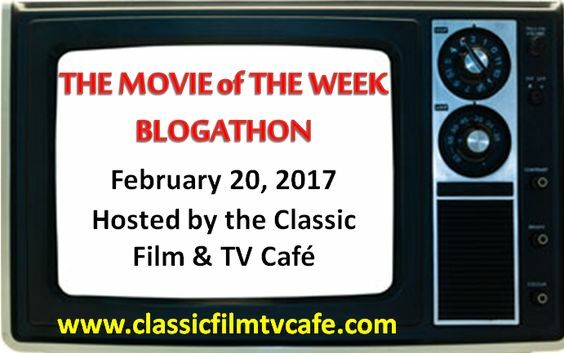 Since it's Friday, don't forget to head on over to author Patricia Abbott's blog, Pattinase, to see what other forgotten or overlooked books other bloggers are talking about today. This is the cover on the paperback I have. But I much prefer the older hardcover edition.